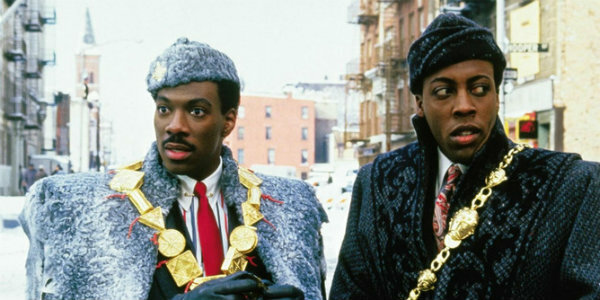 Synopsis: Coming to America, a film about a wealthy African prince coming to New York City to escape an arranged marriage, is the perfect movie to begin a person’s Eddie education. A hugely funny story with a big heart populated by wild characters, it is, above all things, Murphy at his most effortlessly charming and insane. Overview: It’s been a long time since Eddie Murphy made a good movie. At some point he fell into slapstick kid’s movies and sappy movies about inattentive dads. Dreamgirls was probably the last time he really went for it, and he was rewarded an Oscar nomination for the work. But then his next movie was the atrocity that is Norbit. This tragedy, and it is a tragedy, is brought more sharply into focus when you revisit his early work. Murphy first dominated Saturday Night Live, becoming known as the man who saved it after it had entered a slump early in its run. He made Trading Places, Beverly Hills Cop, Raw, Delirious, 48 Hrs, and, the movie being discussed here today, Coming to America. The movie begins in an African palace that, with its solid pastel colours and incongruous sets, looks like something from Wes Anderson. We meet Prince Akeem of Zamunda, as he awakes and is pampered and worshiped. His teeth are brushed for him, rose petals are strewn on the ground he walks upon, his arse is wiped for him, and beautiful women bathe him. We meet him on his twenty-first birthday, the day he must choose his wife. He rebels against his parents, James Earl Jones and Madge Sinclair, and manages to get a reprieve from marriage for forty days to “sow his royal oats”. Instead, along with his servant (Arsenio Hall) he travels to Queens, NYC to find a queen who won’t marry him simply because she worships him. The synopsis seems cut and dry, and if you’re reading this and haven’t seen the movie, you could be mistaken for thinking this would just be another fish-out-of-water romantic comedy. Wrong. The movie is populated with mad, weird ideas and insane characters. Eddie and Hall play four characters each (the first time Murphy would play multiple characters in a movie), and each of these side characters is an excuse to run wild. Each actor plays their protagonist role straight. Akeem is a lost prince full of confusion and charm, while Semmi, Hall’s character, is loyal but longing for their old extravagant lives in Africa. Their other roles as profane, insane barbers, a reverend, the lead singer of Sexual Chocolate, a Jewish man, and an ugly woman in a bar are an outlet for them to engage in some insanity. Its characters like these that elevate the movie from the aforementioned rom-com. The movie is also filled with weird ideas like the MacDonald’s rip off in which most of the action happens and the running joke about a Jheri curl spray called Soul Glo that makes your hair shiny but leaves black marks everywhere it touches. The X factor in this movie is Eddie Murphy. As Akeem he is sweet and charming. A lost little puppy looking for love in the big city. Without the make up or lack of inhibitions of his other roles, Murphy captivates the viewer as himself. Akeem has no bells or whistles, he’s just a man with no funny voice or fat suit. Murphy is utterly disarming and the true master of the reaction shot. He had me in hysterics with a raised eyebrow or a well-timed smirk from the opening credits to the closing ones. Movies like this remind me why Murphy was and is important to comedy in America. He was a pure, young comedian with fire in his belly and reverence for what came before. Who cares where his career is now when he inspired so many black comedians to follow in his footsteps much like he had followed Richard Pryor before him. It is easy to forget the effect he had on comedy until you watch some of his best work and you remember why, for a time, Eddie Murphy was comedy.